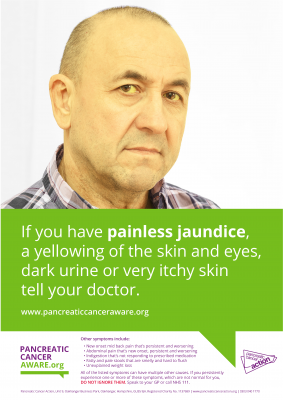 On November 7th 2016, Pancreatic Cancer Action launched a nationwide advertising campaign to raise awareness of the symptoms of pancreatic cancer. The adverts were shown in over 220 service stations, railway stations and shopping centres across the UK via ADMEDIA, as well as in regional newspapers and online. The campaign reached an estimated 14 million members of the public. Pancreatic cancer is the fifth biggest cancer killer in the UK, but has the worst survival rate of the ten most common cancers. Just 5% of patients survive five years after diagnosis. Pancreatic cancer is difficult to diagnose, with the majority of patients only diagnosed when the disease has spread. 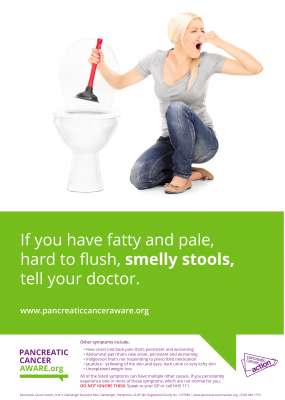 The adverts cover five key symptoms of pancreatic cancer – abdominal pain, unexplained weight loss, jaundice, smelly stools and mid back pain. 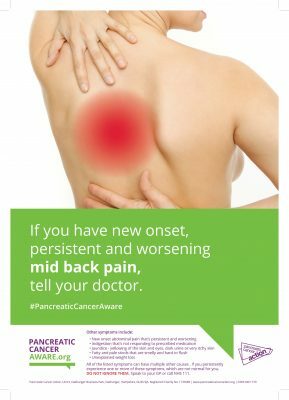 Each advert has an eye-catching photo that illustrates the symptom, along with a link to www.pancreaticcanceraware.org, a website that also launched today with key facts about pancreatic cancer. The adverts, which feature both male and female models, will be placed in washrooms in 128 service stations and 82 shopping centres across the country, and in major railway stations in London, Birmingham, Liverpool, Manchester, Edinburgh and Leeds. The adverts also appear in Manchester Evening News, Evening Standard, Manchester Metro and London Metro, and in various online sites, including dailymail.co.uk. 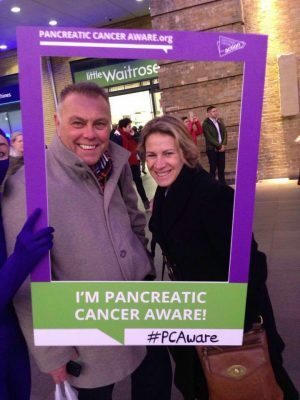 Pancreatic Cancer Aware is raising national awareness of the common signs and symptoms of pancreatic cancer.